We’re all dying to see “the Clown,” but we’re going to have to wait a little bit longer. 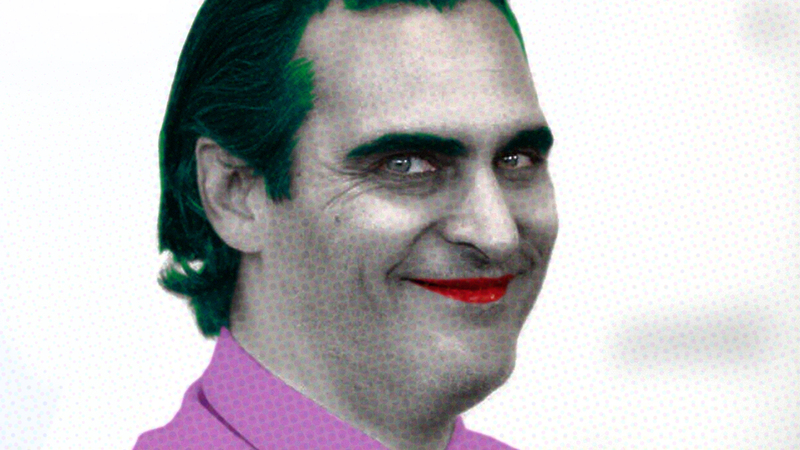 Co-writer (with Scott Silver) and director Todd Phillips has decided to first tease us by releasing a shot of Joaquin Phoenix (Inherent Vice) simply as Arthur Fleck, the man that will become the Joker in his “cautionary tale” about “a man disregarded by society.” Phoenix definitely looks the part with his dismal palette and unkempt hair, a look that is more in line with Heath Ledger‘s greasy “Clown Prince of Crime” than Jared Leto‘s punk rock Joker. The movie takes place in the 1980s and has been described as a “gritty and grounded hard-boiled crime film.” The storyline falls outside of current DC movieverse continuity in which Leto continues to play the Joker, with planned appearances in Suicide Squad 2 and possibly a Joker & Harley Quinn spin-off movie. Joker is being produced by Martin Scorsese. Robert De Niro plays a talk show host with Marc Maron as his agent. Brett Cullen joins the cast as Thomas Wayne, father of Bruce Wayne, a role initially offered to Alec Baldwin. Joker is slated for release on October 4, 2019.